If you love banana bread and you consider yourself a chocoholic, this recipe is for you. They incorporate all the flavors you love in the easy and portable form of a muffin. Of course, the best banana muffins and banana bread are made with very ripe bananas. Sometimes you can get lucky and there will be a bin in the grocery store with a bunch of single, overripe bananas that haven’t sold yet. These are a goldmine for bakers. The longer the bananas are allowed to ripen, the more the sugars are developed in the fruit. This lends itself to a moister and sweeter muffin. Heat oven to 375 degrees F. Melt the butter in a microwave oven or in a saucepan. Combine the cocoa and the hot water with the melted butter. Allow to cool slightly. In a large bowl, sift together the flour, sugar, baking powder, cinnamon, and salt. Using a wire whisk or fork, beat the milk, egg and vanilla extract in a small bowl, blending well. Cut up and mash the bananas. 2 medium ripe bananas will yield about 3/4 cup of mashed bananas. Add mashed bananas to the milk mixture along with the cooled chocolate mixture. Pour the milk mixture into the dry ingredients, stirring just until blended. 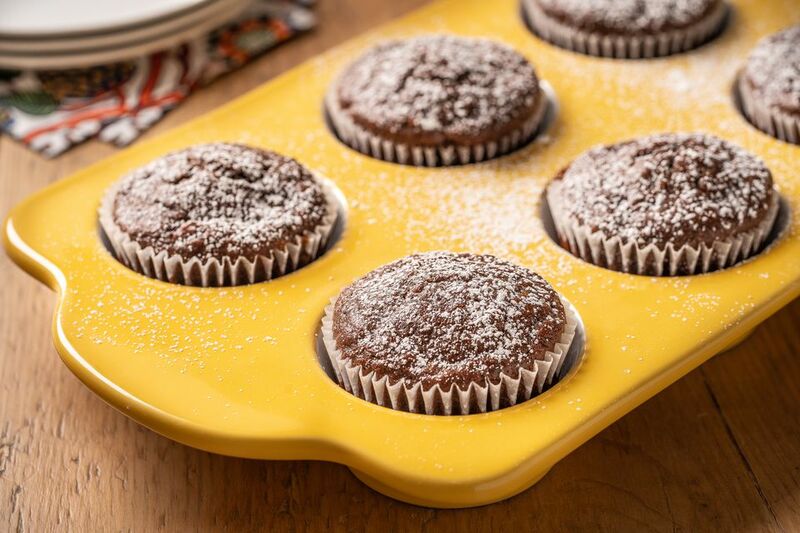 Pour the batter into 12 paper-lined muffin cups. Bake 22 to 25 minutes or until the tops of the muffins spring back when pressed lightly with a finger. Dust the tops of the muffins with confectioners’ sugar.